Turkish investigators reportedly asserted that Arif might be the head of a criminal organization that was trafficking in Russian and Ukrainian escorts, allegedly including some as young as 13. According to these assertions, big-ticket clients were making their selections by way of a modeling agency website, with Arif allegedly handling the logistics..."
Young immigrant models used to entertain wealthy clients seems to be a recurring theme in the history of TrumPIGnorance . I wonder about Maria. They said she was just 12. 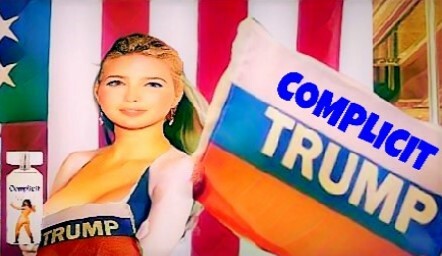 Another thought that has been buzzing around in my head the last couple weeks and BEFORE the SNL skit was How so many people do know a lot of the details relating to #treason and how complicated it will be to sort it all out. 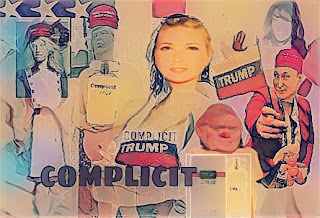 I used the word #COMPLICIT a couple times on twitter and Facebook and was pleased and amazed by the SNL skit. So I put together a couple pics. The SNL skit was perfectly cringe-worthy and likely quite accurate. It certainly reflected how what been feeling, when I see her post something about empowering women. Even when she posts pictures of her kids at a science museum. I can't imagine how conflicted she must feel, or maybe NOT? Anyway I would not pick on the kids but she is not a child and she and Jared are very involved and knowledgeable I'm sure. WOW!